I don’t know what to say…I just know I’m supposed to be here writing. Two different conversations and a package with a letter hand delivered to my porch this morning have confirmed as much. Honestly, I’ve been avoiding the blog. Yes, Phoebe is at home and life is busier in a different kind of way than when we were living in the hospital, but really, life just kinda hurts right now, and coming here to write usually entails soul searching and tears and hashing through emotions and that’s not my favorite thing to do in a public forum. Letting your soul hang out is a dangerous thing, and it can attract a lot of unsolicited advice, but if I’m supposed to write I don’t want to be silent. I guess lately I’ve just thought my messy feelings aren’t worth much screen value. How could they edify anyone or be encouraging? How could it be beneficial to anyone for me to come here and process out loud when I can’t even seem to pinpoint how I feel? I don’t know, but then I’m always surprised to meet people who are praying for Phoebe or following our family’s story here. When I type it all out, I see maybe 10 or 15 people in my mind’s eye who might be reading. When I receive a letter of encouragement like I did this morning from a complete stranger, it reminds me that God has used this painful season for good and that for me to be silent is prideful and short-sighted. So, I’m pushing back the shroud, peeking around the curtain to see if it’s safe to come out. Nope. It’s not safe, but then “safe” is overrated and self protection doesn’t allow God the freedom to use me for His glory. To be insulated from pain is nice, but it’s not honest and I can only hide for so long. It has brought us to our knees and left us running ragged. My Benjamin has a “sadness” he can not explain. My Averic says “something is missing…life just feels like something is missing.” My Deacon has emotional pendulum swings and separation anxiety from Mom. My husband is weary from long nights with Phoebe. I can see the aftermath of last night’s “sleep” when I walk into her room. There are 5 small bowls of different kinds of food and a stale waffle on the bedside table. 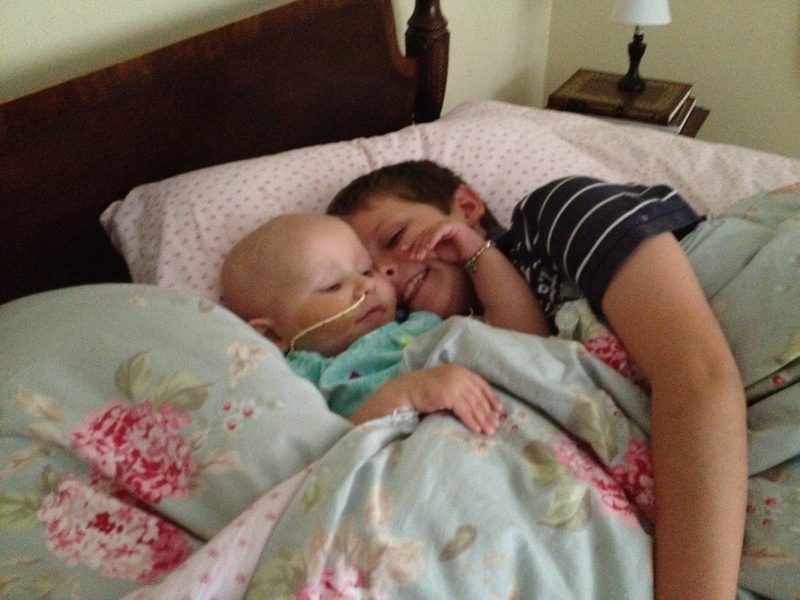 Nathan was up all night, trying to help her find “just the rigth thing” that didn’t taste metalic from the chemo. Finally she fell asleep, only to accidentally pull out her tube and have to have it re-inserted. At 5 am she was ready for the day. This is typical. The daytime continues much like the night. She is emotional, demanding, asks for 4 or 5 different foods before she either gives up or finds something she will eat. We prepare food constantly. She wants in her high chair. She wants out of her high chair, she changes her mind every five minutes. She wants to be on the floor. She wants to sit with Grandad. She wants to sit with Mom. She wants to leave. She wants to stay. She cries. And in between all that, she is happy as a lark. And therapies. Four times a week we must be here for therapies. And clinic on Tuesdays and trips to the lab most every other day to check blood sodium levels. For 10 years we have pursued Mexico and a life of ministry there. “Practice summers” in Reynosa, 9 months of language school, 3 years in the interior with YWAM Guadalajara. An internship in 3rd world agriculture and a dream of pioneering a training farm back in Mexico. And then the paleness, the lethargy, the random vomiting. 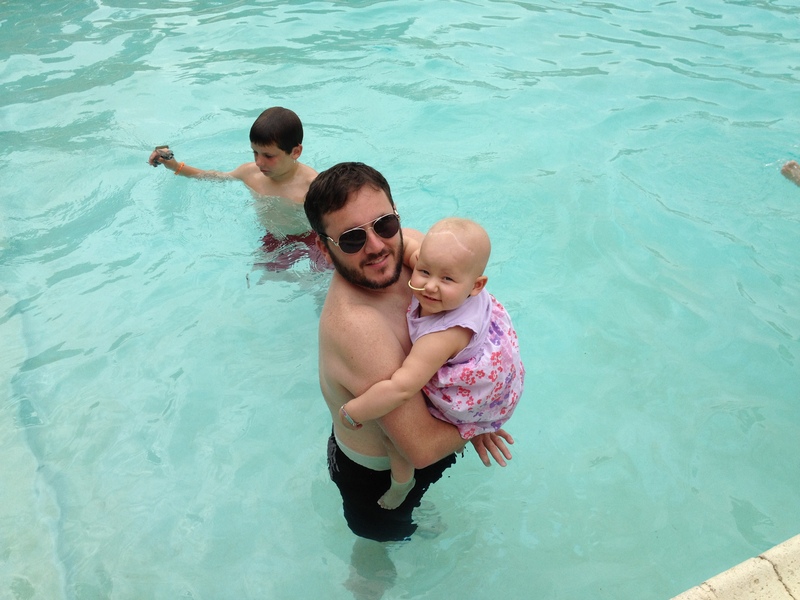 The red-herring “intestinal parasite” as the tumor expanded each day…and then the diagnosis. And what now? What about Mexico God? Did we miss it somehow? Did we misunderstand? Who are we now? Where do we go? Do we make a life in Dallas? How? We need to be close to the hospital for now, but just”doing cancer” feels like waiting for the ax to fall. We are ready to move forward, but how? And when? Where? Phoebe will need endocrinology care for the rest of her life. She will need MRI’s and hormones and DDAVP shots and pills. And that doesn’t fit with a farming life in rural Mexico. Tethered. Immobilized. Trapped. And no certainty of the kind of life that awaits us. These are the very real things that I struggle with each day. My life experience and my heart tell me that God is in control. That this did not take Him by surprise. That He has a plan. But my emotions are in a tail-spin. And I am powerless to “fix” Phoebe and powerless to insulate my boys from the pain, and powerless over our future. So much hangs in the balance. So much is unknown. So, this is the real stuff of cancer. Some days I feel full of hope and I know that Phoebe will beat AT/RT and life will be okay. Other days I merely survive because all feels hopeless. I’m clinging to the hem of His garment….the only place it feels okay to be tethered. 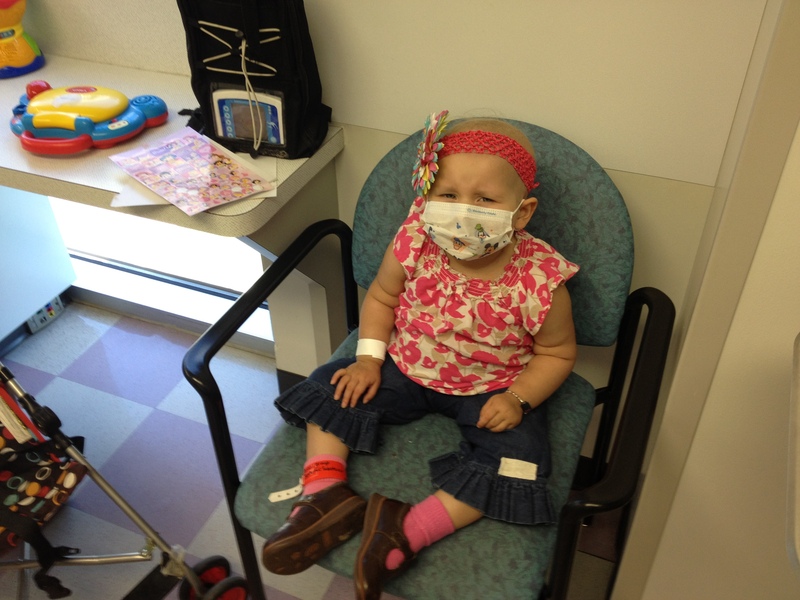 Phoebe started her 9th round of chemo today. This round is the same as the last; one push of chemotherapy through her port this morning, followed by oral chemo each night through her ng tube (here at home) for 5 days, and four weeks until her next chemo. This was a pretty uneventful round the last go round so I am praying for the same this time. Her hair has started coming in and she has the sweetest little downy fuzz all over her head. Our oncologist said it wouldn’t be like that for long because she starts the “hard stuff” again on round 10. That reminder was deflating to say the least. It has been so nice to have a semi-normal life these past few weeks, with lots of time at home and very few ER visits. I wish we were in the home stretch…I wish she was done with Doxorubicen..the worst of the worst. But on we go.. I don’t think I’ll ever get past how wrong it feels to inject poisonous medicine into my daughter. Tonight when I was administering her chemo through her ng tube I was again overcome with how counter-intuitive it is. Catch 22. Phoebe has been so sweet lately, singing and laughing at her brothers and cousins, enjoying herself. It’s been good for my soul, for everyone’s. Her at-home physical therpy sessions have begun and yesterday Phoebe crawled over to the couch where her Grandad was sitting and STOOD UP on her feet! COMPLETELY unassisted! Nathan yelled for me to “hurry!” and I couldn’t believe my eyes when I saw her! She was tilted to the side and unable to bear her full weigth on her left foot since it turns in badly, but she had taken the initiative all by herself and pulled herself up! So today during her physical therapy session she did lots of assisted walking and pulled herself up tp standing two more tmes. I am so proud of her. She is working so hard, and at last it feels like walking again is within reach. I am thanking God for the small, everyday miracles….they are a lifeline for us right now. Progress of any kind, means so much. and here are a few recent pics…. The Dallas SWAT team signed this poster on the wall and had it framed and sent over for the boys. They LOVE IT! 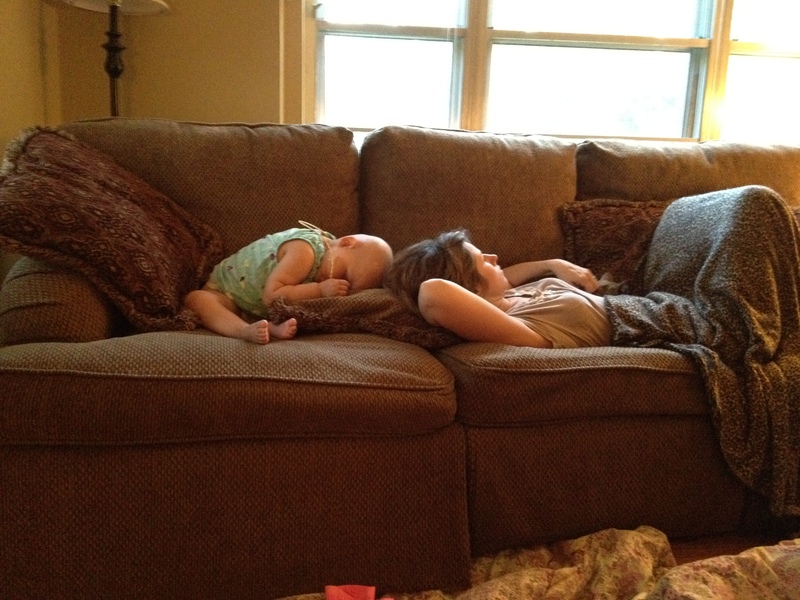 Phoebe and Mommy fall asleep..
Deacon and Phoebe share a book at Barnes N Noble.. Thank you all for your continued prayers and support, letters, e-mails, care packages…we are blessed to be loved and cared for by so many. All is well in the Fair household. Life has been moving along at a “normal as can be” kind of pace and that’s been nice. Phoebe is doing so good…her eyes are bright and she is so animated lately, it’s beautiful. It has been almost four weeks since her last chemotherapy and you can really see the difference in how she feels. Yesterday morning as I shuffled through the kitchen to put the coffee on, I heard Phoebe singing LOUDLY in her bed: “HOLY, HOLY, HOLY, LORD GOD ALMIGHTY…EARLY IN THE MORNINGGGG MY SONG SHALL RISE TO THEEEE” and then “I PUT MY HANDS UP IN THE AIR SOMETIMES, SINGIN’ AYYYYY-OH!” I laughed out loud and then peeked in through her door to find her belting out her song while Nathan snored away peacefully right next to her. It was awesome. Her ANC is down to 4,000 so they were right when they told us that her counts would be down for longer this round. 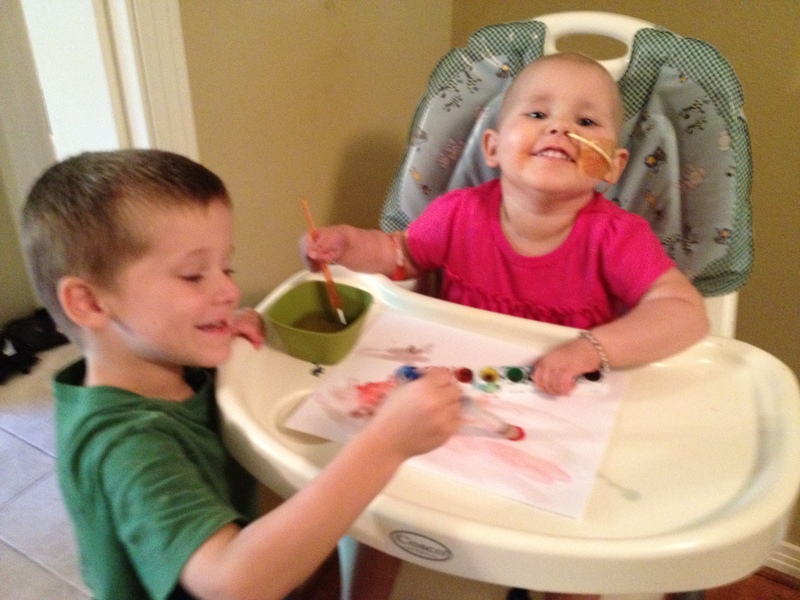 On Tuesday she will begin her next round of chemo so we are praying for her counts to be in a good place by then. We FINALLY got all set up with Phoebe’s at-home health care. She will have her first at-home physical therapy session tomorrow and this will begin her scheduled therapies 3 times a week. We are still waiting for her speech and occupational therapies to get started, but physical therapy is the priority so that she can begin walking again. She was fitted for her orthotics last week and I am anxious to see her wearing them so that we can get the ball rolling. Benjamin (10) had an MRI on Tuesday. He has frequent headaches, most likely related to his blood disorder, but with Phoebe’s condition they exhaust all possibilities to make sure we are not overlooking something serious. Phoebe’s cancer is not hereditary, but both Nathan’s sister and my Dad have had (benign) brain tumors removed when they were children, so anything is possible. God help us if that is the case. I am not worried, and actually glad that they would look into it to this degree just to rule things out. Nathan’s sister and her husband and children are here for a week and we are enjoying our visit with them. We spend our evenings sharing stories from the mission fields where we serve. They serve in Liberia, Africa and although Mexico is a completely different continent and culture, many of our experiences are similar. I thank God often for the family I married into. Nathan’s parents also served in missions in Eastern Europe for 16 years and Nathan lived overseas until he was 10. I love listening to my father in law share stories with my boys about what it was like smuggling Bibles behind the Iron Curtain during the Cold War. I am thankful for the heritage my children have. I apologize for going so long between updates…life is taking on a more normal shape and I am often relieved to have nothing to report! 🙂 Phoebe’s next MRI is scheduled for August 13th, three days before she turns 3. So we soldier on, trying to be as normal as possible, and enjoying the small things. The small things are the big things…they really are. Thank you all for praying for our family, some days we just hang in there, other days are full to overflowing with goodness and gratitude. It is with such deep sadness that I have to post that our little Maddie passed away this morning. 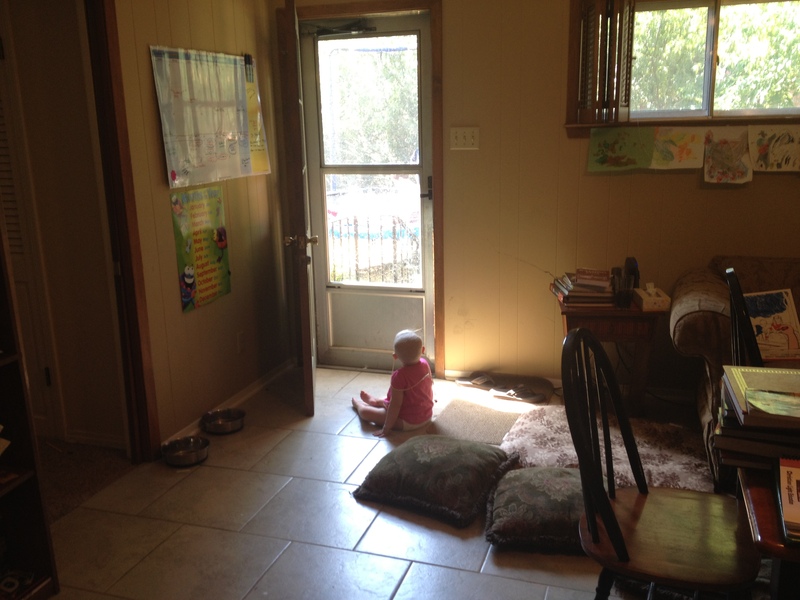 She was with her mommy and daddy at home and it was very peaceful. She was so brave, she fought so hard and will always be my hero!!! We love you STAR!! I think this is the longest span of time I have gone without posting. The most obvious reason is that Phoebe is home and life is moving along, but school is happening alongside a lot of fun summer activities, and my sister in law and her husband and children have been visiting from Liberia, Africa where they serve as missionaries. This was their first time to meet Phoebe and our first time to meet their second daughter, Myriam. 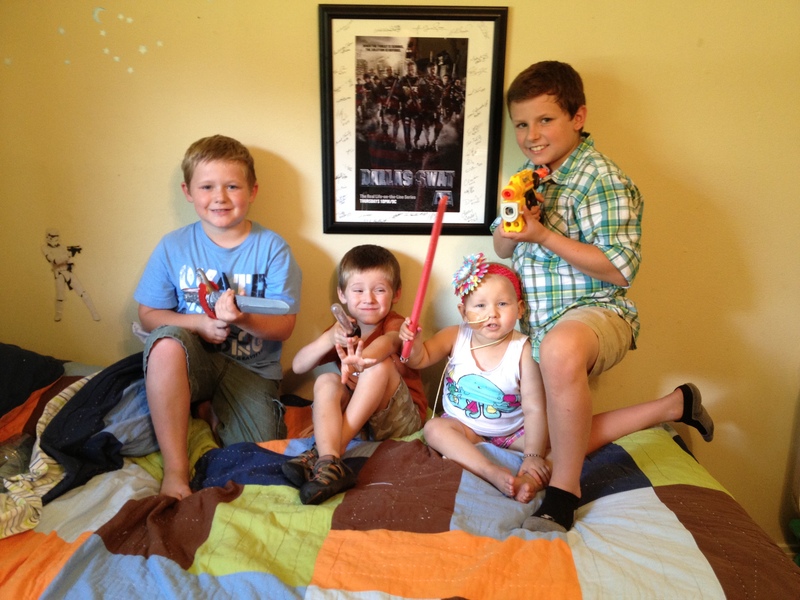 It was so nice to see them after three long years and the boys had a wonderful time with their cousins. Phoebe has been doing well for the most part. We did have to make 3 unexpected trips to the hospital this past week; her ng tube got pulled out on two separate ocasions and then we had an ER visit the other night because she had a qustionable mental status upon waking from her nap. At the time, we knew her hemoglobin could be low and that she was also likely experiencing some drug withdrawals from her Methadone wean. It’s always deflating to decide to go to the ER late at night and know that we will be there for several hours just to have her labs checked, but with the possibility of a dangerously low hemoglobin level, we couldn’t risk it. I don’t know how we would do this if we didn’t live 15 mins down the road from the hospital. Now that Phoebe is home more often and life has settled down a little (a very little), I think the reality of this whole thing has taken root in me. I feel a pervading sadness underneath the surface most always. I know some things now that I didn’t really have time to process before. For instance, I now understand that come what may, if we are a year out, or two or more from Phoebe’s chemo treatment, we will live our lives with future MRI’s and their possible life-altering results forever. I know now that secondary Leukemia is a possibility down the road. I am aware that Phoebe’s fellow AT/RT friends are slipping into eternity…some of these, the very first families to reach out to us when Phoebe was diagnosed. These things weigh heavy in the quiet spaces of my life. I prefer distraction. I also have realized the ways that Phoebe has changed. Her cognitive abilities are wonderful, her intellect intact. 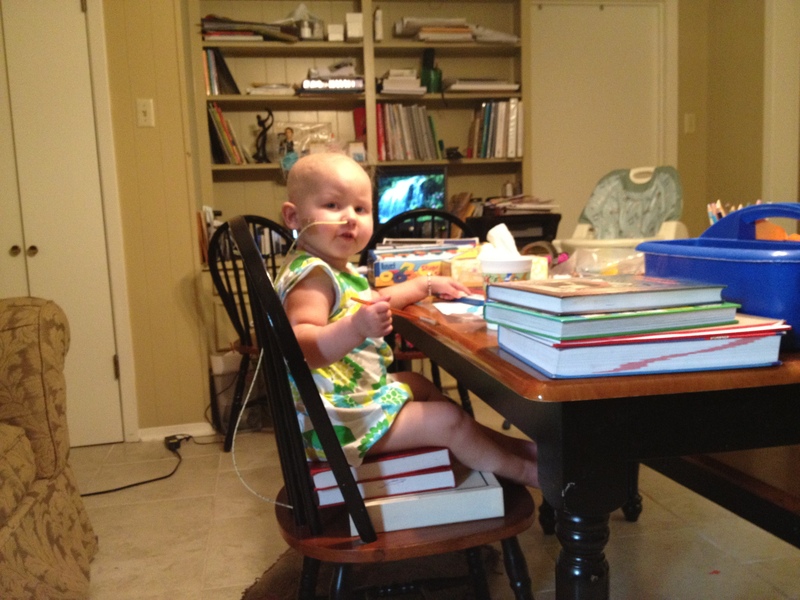 I could not have hoped for a better outcome from her brain surgery. But…she no longer has the attention span for books. She will not allow me to read to her or thumb through the pages of a book just looking at pictures by herself as she used to do. She has no attention span even for her favorite shows…she can not focus long enough to watch or follow a story line. The steroids that she must take for the rest of her life render her impatient, demanding and prone to mood swings. I miss who she was before, even as I love her now. These are the little losses strung out over this cancer road. These are the subtle ways our lives change a little every day. The medicine that kills her cancer, kills her attention span and healthy cells. When Phoebe was first diagnosed, we looked into the Burzynski clinic that several people had mentioned to us. There is a popular documentary out right now about this controversial man and his cancer treatment that utilizes antineoplastins. We were warned to stay away by our neurosurgeon. He said it was the only piece of treatment advice he would give us. But, we researched, even called the Burzynski clinic for information. 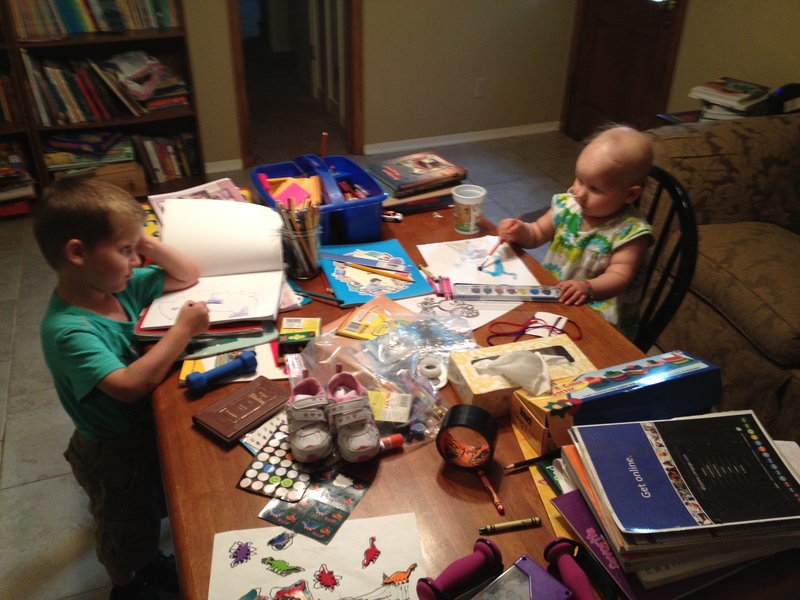 When they heard Phoebe was 2 and had AT/RT, it became apparent that they were not convinced they could help. Upon further research, I dicovered that they have a 0% success rate in treating AT/RT cancer. So, that was the end of that. 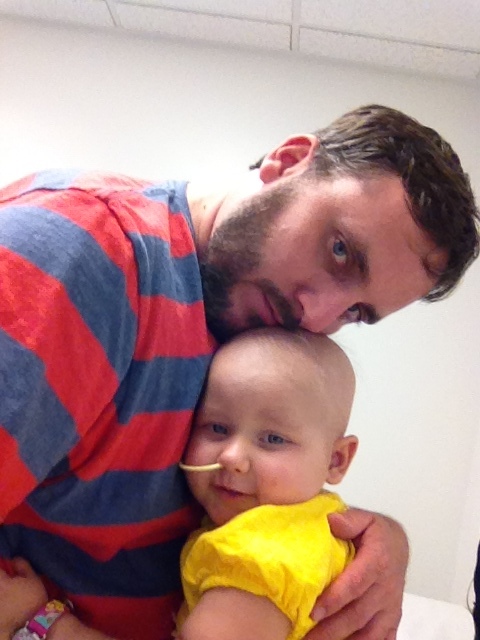 Next to Gliomas, AT/RT is the big, bad, nasty childhood cancer. Thus we chose the Dana Farber chemotherapy protocol which has a 50% success rate in treating AT/RT cancer. We made the only choice there was to make. But waiting for chemo to work or cancer to kill is a feeling akin to being trapped in a small, dark space. I wish I could expalin it better. Life is on hold. That’s what I mean. And “doing” cancer is maddening. The not knowing is of course the hardest part. Who will I be when this is all over? Well it depends on how it ends, I think to myself. But no, I’m forever changed either way. We all are; Nathan, myself, the boys…Phoebe. How will God shape this thing for our good, for us, who are called according to His purposes? All this growing thick skin is for the birds and I’m tired. And that’s what I feel right now. I feel quiet. And never quite at ease. And unwaveringly grateful for the cherubic little girl asleep in her canopy bed right now…breathing and dreaming. Tonight I am remembering these lines from Rilke’s Book of Hours, Love Poems to God…. Nearby is the country they call life. You will know by its seriousness. 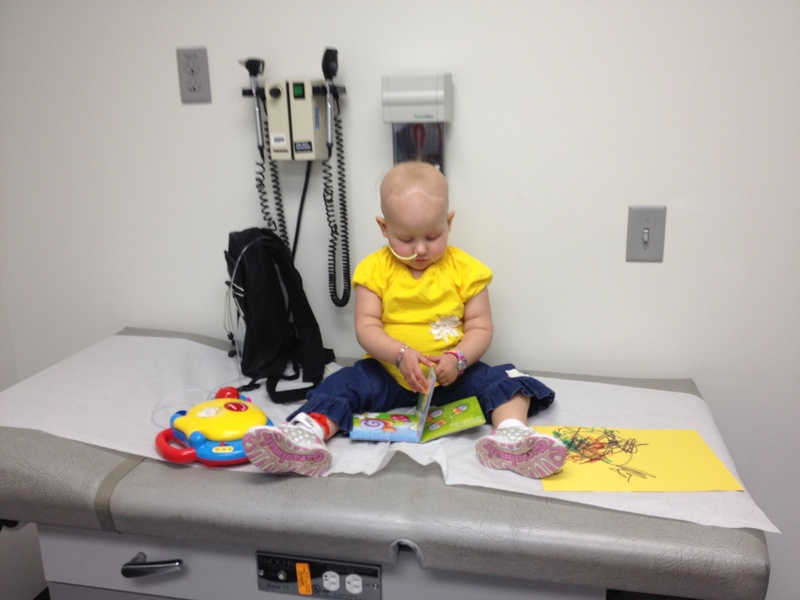 Phoebe had all good news at clinic on Tuesday! Her counts were still hanging in there and her sodium was a perfect 140. Here she is with her Daddy. Did I mention that I got to go swimming the other day? This is how I roll when I’m doing my watercolor painting..
Deacon is my favorite painting buddy. And one last thing before I go….